National media stories often portray Detroit’s conventional public school district as underfunded. Variations on this “Detroit schools are underfunded” claim are commonplace in the media. But in almost every instance, the claims are undercut by data readily available from the Michigan Department of Education. Over the last 20 years, the public school district in Detroit has received, on average, $11,797 per pupil for its general fund. The statewide average for school districts over those 20 years was $8,673. Those dollar amounts include local, state and federal funding that flow into school districts’ general fund, which is used to pay day-to-day expenses. The gap between the per-pupil funding for Detroit’s public school district and the state average has been growing in Detroit’s favor over the last several years. For example, from 1997-98 through 2003-04, Detroit received on average $1,060 more per pupil than the average Michigan school district. 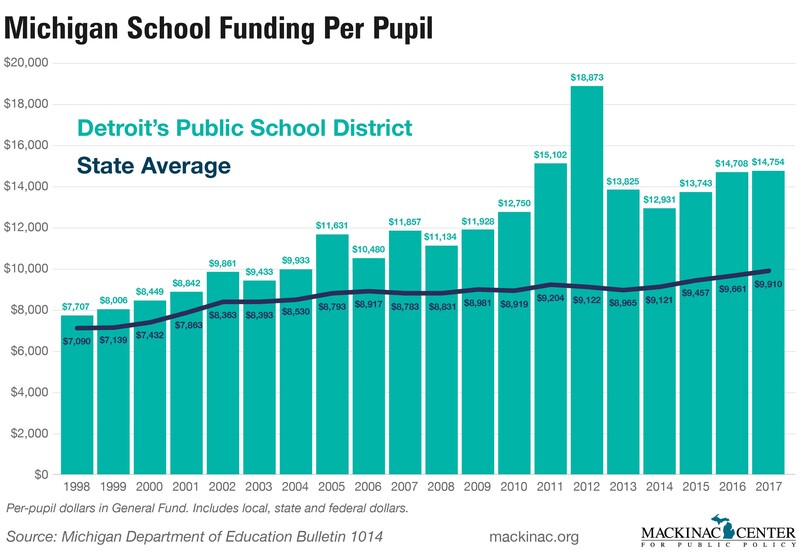 From 2004-05 to 2016-17, that gap grew to $4,234 per pupil, on average, in favor of Detroit. The data is from 1997-98 to 2016-17, the most recent year the Michigan Department of Education has released. Evan Caminker of the University of Michigan Law School, Bruce Miller of Miller Cohen PLC and Mark Rosenbaum of Public Counsel were all identified as lawyers for the plantiff and did not respond to an email seeking comment.